Choosing the right running shoe is vital in order to get the most enjoyment out of your running, and to minimise the risk of injury. Poor choice of shoe is the most common cause of many foot and lower leg injuries in runners, not to mention blisters and lost toenails! The price of trainers can seem extraordinarily high these days, but it is worth remembering, if you get the right ones they could see you through between 300-500 miles of injury free running. It is also worth noting that the most expensive may not be the best for you either – it depends on your type of foot, the way you run and where you run! The wet foot test is the simplest way to get an initial idea of what type of foot and style of running you have. In bare feet, get the soles of your feet wet and then step on a dry surface like a patio, concrete or bathroom tile, and take note of the footprint shape that you leave behind. Ideally you should try to run, instead of walk, for this test as the foot acts differently at different speeds. If we look at the left footprint in the image we can see that the whole foot is visible. This is indicative of an overpronating foot – that is one that rolls inwards as the weight transfers from the heel to the toes . When the foot is in an over-pronated position three major joints in the foot are out of alignment. This causes the foot to become structurally unstable, and, in turn, the muscles, tendons and ligaments of the lower leg are forced to work harder in an attempt to stabilize the foot. If this is the case you need a MOTION CONTROL SHOE. This is why over-pronaters are vulnerable to plantar fascilitis (heel pain), shin splints, achilles tendonitis, iliotibial band syndrome, knee pain and other overuse injuries. The third footprint shows a very light foot print with little or no arch visible. This is indicative of a under-pronating or supinating foot – one which rolls outwards as it strikes the ground. The most severe over-supinators tend to have a history of recurrent ankle sprains and/or stress fractures. Runners who supinate excessively require the highest level of cushioning in their running shoes and should avoid shoes with stability features, so go for a CUSHIONING SHOE. The centre footprint shows a neutral (ideal) foot strike on the ground. Here the weight is transferred from the heel to to the toes with no sideways roll of the foot at all. This type requires a STABILITY SHOE to keep the foot in this optimum position. 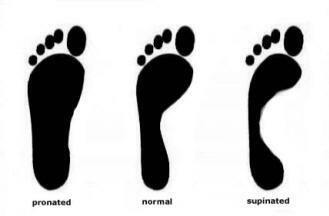 Whilst the wet foot test is a good indication of gait, I would highly recommend you go to a specialist running shop that offers video gait analysis. Here they will video your foot strike from behind on a treadmill in a natural running situation to accurately determine which shoe you require. Make sure the shoe bends where the ball of your foot is, where your toes bend. Everyones foot is different with different toe lengths etc. Most good trainers will last between 300-500 miles, so it is a good idea to keep a record of how many miles you have run in each pair. With constant use and age, the cushioning gets compressed and loses it’s effectiveness. As the shoe ages you will probably start to notice some dull aches and pains in the sole of the foot if the shoe is getting too old. You may also start to experience knee and hip pain after short distances. It’s often best to alternate between two identical pairs to make sure you always have a pair to run in if one pair suddenly seems painful. Never run a race in new shoes, especially longer distances – Marathons are the wrong place to try out new kit!